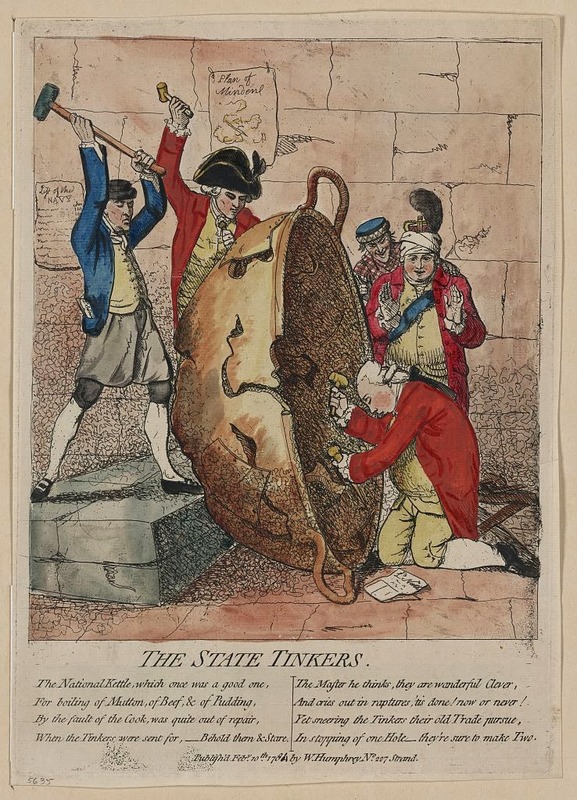 The State Tinkers, James Gillray, 1780, Library of Congress. At first I thought that the Library of Congress had gotten the date wrong, but a close look at the publication date at the bottom shows that the "4" was written on later, over the date. Personalities representing the heads of Government are busily chipping away at "The National Kettle." King George foolishly proclaims the "Tinkers" as saviors, when in fact they make two holes for every one they claim to fix. Brandishing a sledgehammer and dressed in the clothing of a common sailor is John Montagu, Fourth Earl of Sandwich, and First Lord of the Admiralty for the North Administration. Sandwich wears a simple black cap and single breasted blue jacket. His jacket has open slash cuffs, cloth buttons along the front, and waist pockets. A paper poking from that pocket helpfully identifies him as Lord Sandwich. His pale yellow waistcoat is double breasted with cloth covered buttons and simple slit pockets at the waist. Tucked into the waistcoat is a white neckcloth. Sandwich's slops are grey with what might be a fall front fly, but I can't be sure. His breeches are black, stockings white. Pointed toe shoes with rectangular buckles finish off the First Lord's slop clothes.